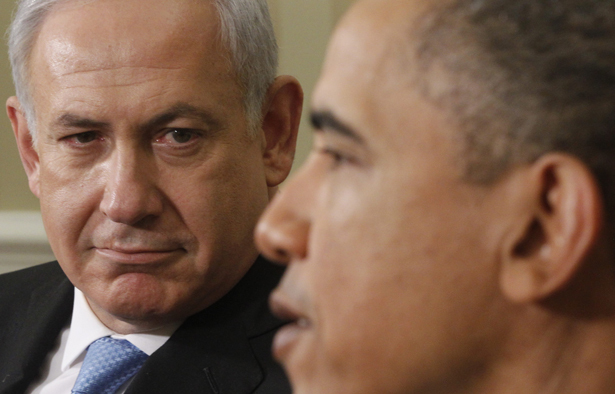 By placating Israel’s hawks, the president is making the Iran he wants less likely. If President Obama’s remarks to the Israeli media are any indication, his upcoming (and long-delayed) visit to Israel next week is going to be a troubling one. According to some readings, Obama’s statement was designed to mollify Israeli fears that Iran is getting close to a bomb. But really, the impact of the statement is the opposite, because a year seems like a pretty short time to most people. And, in reality, Iran has taken no steps toward any militarization of its nuclear research. Quite the opposite, Tehran has countered the overblown rhetoric of American and Israeli hawks by changing much of its 20 percent–enriched uranium into fuel for its research reactor, in a manner that guarantees that it can’t be easily converted into material for a weapon. And, Obama repeated the unfortunate theory that economic sanctions are compelling Iran to come to the negotiating table and that, behind those sanctions is the threat of US military action. “When I say all options are on the table, all options are on the table. The United States obviously has significant capabilities,” said Obama. The contrary reality, though, is the economic sanctions and military threats make a deal with Iran less likely, not more likely, since Tehran will not make a deal that surrenders its basic right to enrich uranium under pressure and threats. Only a series of important concessions by the United States can lead Iran into an accord, and among those concessions are first, a clear statement from Washington that Tehran has the right to enrich and can continue to do so under international supervision, and second, a clear declaration that economic sanctions against Iran will be lifted as part of a deal. US President Barack Obama has reiterated his pledge to negotiate with Iran on concerns over its nuclear energy program, once again rejecting Israeli insistence on taking military action against the country. Despite Obama’s continued talk about options on the table, he’s bluffing. An American attack on Iran would be so catastrophic in its effects in the region and around the world that the White House won’t seriously consider it. In any case, after such an attack Tehran would undoubtedly learn the lessons of North Korea and engage in a crash program to manufacture nuclear weapons in secret, in secure underground facilities—and that’s where Obama’s one-year timetable might actually come into play. In defining the problem as he did—when Iran could get a weapon, rather than when it could have the capability to build one—he subtly indicated that he and Mr. Netanyahu still saw the problem in very different terms. The Israeli position has long been that Iran must be denied the capability to piece a weapon together. Mr. Netanyahu and his former defense minister, Ehud Barak, argue that if Iran is just a few screwdriver turns away from being able to construct a weapon, it will have the same power in the region as if it actually had one. Like Joe Biden’s address to AIPAC earlier this month, when it comes to Iran President Obama’s visit to Israel will be an attempt to walk a fine line: placate Israel’s hawks, including Prime Minister Netanyahu, while maintaining America’s nuanced policy on Iran. That’s unfortunate, though, because it means Obama will further lock himself into the sanctions-plus-military-threats policy that he’s adopted since 2009. That doesn’t mean that an agreement can’t be reached later this year, but it does make such an accord less likely.